Friday is a public holiday, Freedom Day, the day when we commemorate our first democratic elections in 1994 . It's also the day 72 individuals and 5 relay teams are going to swim the 7.5 kilometers it takes to cross from Robben Island to Bloubergstrand. The event is a fund raising vehicle for the Vista Nova School for children with learning disabilities and cerebral palsy and this year the plan is to hand over R75 000.00 to the school. It's sponsored by Cadiz FSG who's CEO, Ram Barkai, is an ardent open water swimmer. 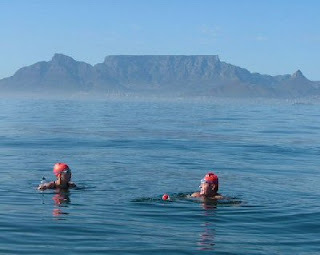 The swimmers will be leaving the island at 10am and the first swimmers should arrive at Bloubergstrand just over 2 hours later. It's amazing to watch the swimmers emerge one-by-one from the water. They will be all shapes, sizes, sexes and ages. Do yourself a favour, go and enjoy a day at the beach and support these athletes as they pit themselves against the elements, and a hungry fish or two, to raise funds for an extremely worthy cause. We have arranged for 6 units of GPS tracking devices to be placed on the boats of the top 5 swimmers and one extra Ginny pig. Do you Schmaak this post? Now you can Moer a taxi - Seriaas! A possible replacement for Guns N Roses?